To ask other readers questions about Where the Crawdads Sing, please sign up. This intrigues me, but I am super sensitive to incredibly sad stories. I see a lot of people using variations on the word "heartbreaking" in their reviews. Does it end on a sad note? Can I just say that I loved everything about this book and leave it at that!?! Where the Crawdads Sing is a story of resiliency, survival, hope, love, loss, loneliness, desperation, prejudice, determination and strength. This book goes back and forth in time to tell the story of Kya Clark a.k.a. the Marsh girl. She lives on the outskirts of town, in the Marsh, and the locals look down their noses at her, she is judged, ridiculed and bullied. But there are those who show her kind All the Stars!!!!! Where the Crawdads Sing is a story of resiliency, survival, hope, love, loss, loneliness, desperation, prejudice, determination and strength. This book goes back and forth in time to tell the story of Kya Clark a.k.a. the Marsh girl. She lives on the outskirts of town, in the Marsh, and the locals look down their noses at her, she is judged, ridiculed and bullied. But there are those who show her kindness, friendship, and show her love. Oh, how I loved this book! Kya was a young girl when her Mother walked away without looking back. Soon, all her siblings followed suit, leaving Kya alone with her often absent, drunk, and abusive father. She is left to care for their home, to cook, clean and take care of both of their needs. How her situation pulled on my heartstrings. She had to learn to shop, to cook and to provide food for herself in her father's absence. All while dealing with loneliness, feelings of abandonment and loss. Always wondering when and if her Mother will ever return. She was a smart and clever girl who knew the marsh and found ways to make money and provide for her basic needs. Soon 'Jumpin and his wife, Mable, show her kindness, generosity and love. I dare you not to adore this couple! As Kya grows and learns more about life through her interactions with the creatures of the Marsh, two young men enter her life. One is her brother's older friend, Tate, who teaches her to read and shows her acceptance and happiness. Another brings her hope of a future but won’t introduce her to his friends and family. Could one be her chance at happiness? A chance at belonging? A chance at being accepted? A chance at being loved? A Chance for growth? Or will history repeat itself? In 1969, local football legend, Chase Andrews is found dead. Rumors swirl as to motive and possible suspects. Rumors have been circulating for years about Chase and his involvement with the Marsh girl. Could she be his killer? What motive could she have? This book had a little bit of everything that I love: a likeable main character who pulls at your heartstrings, murder mystery, atmosphere, drama, coming of age, and romance. There are several characters who give and show kindness including, Tate, the cashier who gives back too much change and the couple who make sure Kya has what she needs. What is the saying? Those that have the least to give, give the most! There is a police investigation and court room drama and some twists and turns I did not see coming. This book is beautifully written and contains poetry and vivid descriptions of the Marsh. I highly recommend this book! It's thoughtful, evokes emotion, and transports the reader back in time to the Marsh. I loved every page. You know that person? The one who doesn't like what everyone else seems to love? There has to be someone in the outlier club and this time it is me. I was highly anticipating this book after reading all the praise from readers whose tastes usually align with my own. Unfortunately, I should have DNF'd this one when very early in the book, my eyes glazed over and I began skimming pages and pages of descriptive writing. The author is a nature writer and those sections were undoubtably well-written. You know that person? The one who doesn't like what everyone else seems to love? There has to be someone in the outlier club and this time it is me. I was highly anticipating this book after reading all the praise from readers whose tastes usually align with my own. Unfortunately, I should have DNF'd this one when very early in the book, my eyes glazed over and I began skimming pages and pages of descriptive writing. The author is a nature writer and those sections were undoubtably well-written. But I don’t care for overly descriptive writing. And then there's poetry. I skipped over those as well. Everything other reviewers say they enjoyed were things I intensely disliked. I struggled with believability. I won't list them all, but the implausibility of every single plot point was something I couldn’t get past. To make things worse, romance is not a genre I enjoy and the romance in this book had a very YA feel to it. Finally, I found the use of dialect distracting to read and often in the same paragraph a character would switch from local dialect to proper English. Sometimes my love of the story or the strength of the writing is enough for me to ignore implausibility and move past a few things I don't like. This wasn't one of those times. Recommended for readers who enjoy long, descriptive nature writing, and those who have no trouble suspending disbelief. If I had known these things before starting this book I would have skipped it, so perhaps my review will help other readers like me. Ctroskoph I did not love it either -- thought it was me. I hated the ending and thought it was contrived. WHERE THE CRAWDADS SING is a gentle yet symbolic depiction of the valiant survival of Kya Clark—a reclusive young girl who has been abandoned by her parents, siblings, school system, the entire town surrounding her, and what ultimately feels like life itself. Mother Nature has literally become Kya’s caretaker, and deep in a lonely Marsh along the North Carolina coast is where Kya will not only hide, but blossom into a primal independent being, coaxed inside the loyal embrace of an indiscriminate wilderness as she embodies its uninhibited spirit. Until a young boy from “yonder” befriends Kya, and her lonely existence is shaken straight to its solemn core. Add to that the curious unsolved murder of the town’s local “Golden Boy”, and all that’s left to say is GAME. ON. Although this story delivers one hell of a powerful punch, it is sculpted with quite a humble hand; a delicate wind that keeps building and building until it ends up emphatically blowing your mind. The writing. The Writing …Prose so unique; so breathtaking; so utterly beautiful that a single description of a firefly suddenly grows so intimate and probing, and I might have gotten something in my eye—*sniff*. Here you’ll find sentences that read like poetry, with a lyrical rhythm that sways the reader like the gentle rocking of a boat. Yet it is not showy over 0ver-the-top --- but perfect. Owens doesn't tell us what to think, but alludes to each message through writing so alive you can almost hear it breathing. She carries us through her dense, atmospheric tone and persuades us to seek and find; discover and examine, all on our own. She allows her striking imagery to guide us as the marsh has guided Kya, and I felt as though I could smell the sea and taste the sweetness of new love. There were a few tedious moments where I thought this story might begin to drag and possibly not live up to its hype, but I was wrong, and this story was so, SO right. A story of survival, of what the depth of loneliness feels like when a young girl is abandoned first by her mother, then her four siblings. Even at five Kya understands why they left - because of her father, because of his meanness, his abuse, his drinking. What she doesn’t understand is why they left her behind and neither could I. She remains pretty much alone since her father comes and goes until he doesn’t come back. It was gutting as she sits on the beach with the gull 4.5 stars rounded up . Chris Just finished. Loved it! Beth Eisenberg I loved every minute of this book. MEMORABLE CHARACTERS AND MEMORABLE STORY. For me to rate a book five stars it has to give me something bout of the ordinary, make me feel. Most of all it has to be a book or contain a character or characters that I won't forget. Above all it has to make me feel. This book did all three. Kya, aka Catherine Clark, the Marsh girl is an unforgettable character, abandoned by her mother at she six, her siblings shortly after. By ten she was alone in the Marsh raising herself, her main source of comfor MEMORABLE CHARACTERS AND MEMORABLE STORY. For me to rate a book five stars it has to give me something bout of the ordinary, make me feel. Most of all it has to be a book or contain a character or characters that I won't forget. Above all it has to make me feel. This book did all three. Kya, aka Catherine Clark, the Marsh girl is an unforgettable character, abandoned by her mother at she six, her siblings shortly after. By ten she was alone in the Marsh raising herself, her main source of comfort the natural life found in the North Carolina Marsh, the gulls she fed daily. She learned not to trust nor depend on anyone but herself. She was smart, curious, feArless and so lonely. As if this character wasn't enough to remember, there are also some supporting characters that play an integral part in her life. Jumpin and Mabel, a black couple that try to help Kya in whatever way she will accept. Tate, who has known her since she was small, teaches her to read anc much more. What will one do in the face of such loneliness? How much will they sacrifice if they reach out, trust? Prejudice is a big theme, because as the Marsh girl she is considered illiterate, unclean, and none in the village reach out to help. There is of course a villian, who claims to love her, but marries another, breaking her heart . This is there another thread comes in, a story told in alternate chapters, as when he is murdered , she is accused. Also where another wonderful character comes in, a man, 74 years old, a retired lawyer who comes out of retirement to defend her against a town that already assumes she is guilty. I could nitpick a few things, but I won't. I loved and learned much about the natural world, a different way of looking at things. On walks I take along the river I will look at things I ordinarily wouldn't. A survival story, what Kya has to do it not easy, but since she has little choice it is what she does. Making the most of what one has, regardless of how little. More than one I had tears running down my face, so this gets five, big marshmallow stars from this reader. This was mine, Angela and Esils August read, and as always our reads and discussions are something in which I look forward. I really enjoyed the parts of this book that were related to the marsh and the natural world, but the story itself did not wow me. I am definitely in the minority here - many glowing reviews, but it had a “women’s literature” flavor to me that I don’t personally care for. A nice fiction debut for Owens; just not my cuppa. there are currently 582 people waiting for this book at my library. at first i thought that notification was a glitch; but then i read this, this impossibly tender story, and now im shocked as to why the waitlist isnt twice that. there is a reason this book has become so sought after, and it feels like a privilege to have experienced it. this is one of the most memorable coming-of-age stories i have read in quite some time. it is a story that proves the growth of a person and the cultivation of there are currently 582 people waiting for this book at my library. at first i thought that notification was a glitch; but then i read this, this impossibly tender story, and now im shocked as to why the waitlist isnt twice that. there is a reason this book has become so sought after, and it feels like a privilege to have experienced it. this is one of the most memorable coming-of-age stories i have read in quite some time. it is a story that proves the growth of a person and the cultivation of nature are not mutually exclusive. this book is a celebration of all life, human and mother earth alike. there is a very special connection between kya and the environment which raised her. the elegant prose and lyrical depictions of the marshlands are so beautifully comforting, guiding the reader through kyas world, just as it guided her throughout life. i cannot describe what an intimate feeling it is, to see the world through kyas eyes. its so enlightening to see someone comprehend that even though there is a harshness to surviving, there is also immense wonder and beauty. this story is as touching as it is inspiring. and i now have a very strong desire to take an evening walk, look at the stars, and just marvel at the world in which i live. When Kya Clark is 6 years old, she watches as her mother walks away from her, seemingly without a second thought. With the departure of their matriarch, the Clark family slowly but surely vanishes into the marsh that will become the only family Kya will ever know. Her siblings leave shortly after her mother, leaving Kya alone with her father who ne 4.5 all aboard the hype train stars!!! This 5* book is masterfully written, with outstanding character development. That alone would be a great book but there is much more. There is a love story and mystery woven through the story, and add art and poetry to that and you have this incredible book. Well as to the plot I will give you a little information on that, although you’ve all probably read the book blurb. At the beginning of the story we are introduced to Kya, a 6 year old little girl who has already been traumatized for life. Her mother leaves her father and the five children and never returns. Then slowly throughout some years her older siblings leave and then finally her brother whom she was very close to and her drunken father. They leave her completely alone in their falling down shack, no provisions and barely any clothing. She was only 14, she was completely alone and had no idea how to survive, but somehow she does. She has an incredible will and she loves the marsh, it’s the only home she’s known. She learns to fish, cook and clean just by remembering how it used to be. Barkley Cove, where she goes for groceries and gas has a store that is run by an extremely kind and generous couple who have lived on the marsh their entire life. She exchanges mussels and then smoked fish for gas for her motor and a few groceries. Mabel gives her used books, shoes, anything that she can get donated. They were her only friends. Kya has two real love relationships in the book. Tate she has known all of her life but now that she is older she views him differently, she begins to feel real love. He teaches her how to read which opens up the world to her. He is in her life for quite a few years and she seems happy, her life is good. She loves the marsh and all that inhabit it. She collects many things and categorizes them. From the books Tate brings her she learns biology, math, how things grow and change and she is fascinated by the marsh. The author describes the marshland so well I felt myself transported there, felt the humid air, the squashing feel when I walked and encountering all of the creatures described in this book. It’s incredible to think that this could happen but I really think there are those people who live in the marsh. Quoting from the book “this infamous marsh became a net, scooping up a mishmash of mutinous sailors, castaways, debtors, and fugitives dodging wars, taxes or laws that they didn’t take to. The ones malaria didn’t kill or the swamp didn’t swallow bred into a woodsmen tribe of several races and multiple cultures. .. . . . .two hundred years later, they were joined by runaway slaves, who escaped into the marsh and were called maroons, and freed slaves, penniless and beleaguered, who dispersed into the water-land because of scant options." After being disappointed in her relationship with Tate she finally decides that perhaps she could be more trusting. She shares things with Chase, a boy from town who tells her he loves her, talks about a future. But everyone always leaves Kya. Then one especially happy day for Kya, she had met with the publishers of her books, two at this time, but gets an awful message from Jumpin’ upon her return, Chase is dead. The sheriff is looking for Kya and there are rumors in town that perhaps Chase’s death was not an accident. Oh my gosh this review is too long and there is so much more to say. I don’t want to spoil any portion of this gorgeous read. There is beautiful poetry and paintings that I felt I could see. Read this book, you will be wonderfully surprised, entranced and feel great about a book again. Read Kya’s story, she will stay with you a very long time. Listening to this book was a ‘fantastic’ choice!!! I plan to buy the physical book, too. I want to re-read many of the sentences - see them in written book form...and own a book by Delia Owens. She’s a one-of-a-kind-author!!! This book could easily become a modern classic! that the smells and visuals of the wildlife — made me feel as if I was there too. — the *marshlands* - becomes a living character in this story. while being outside —surrounded by plants -birds - squirrels- trees- and water myself- added reminders of respect for the world around us....which those who spend time alone in nature know what I’m talking about: quiet transformative thoughts arise with the beauty of the ecosystems. Our human energy is tantalizingly free in ways it never is when indoors behind our computers and other technical devices. The Audiobook narrator -Cassandra Campbell, completely transported me to this world. The voice of Kya was PERFECT!!!! She used many different inflections for each character. I wanted to know Tate Walker and Jumper...but it’s Kya Clark, who dominant my heart and thoughts. She was not only abandoned by her family - but so many in her town rejected her. which made me like her more. but to suspect her of a crime... of murder? - it was almost hard to suspend belief. And so ugly to have a reputation as ‘swamp trash’. And how is it possible - and why - for heavens sake would a little girl kill an older bigger football player, Andrew Chase? book with ‘mostly’ positive reviews....were surprises to me. The 50’s is completely Kya’s story - from when her mother left - [The Dominate Story].....*Kya Clark*!! It’s Kya we can’t stop thinking about!!! Kya couldn’t read or write - but there is an inspiring coming of age story in here with a few Guardian Angels - so to speak who are ‘for’ Kya. We witness Kya out-shine her neglectful youth. Really emotionally moving!!! Completely captivating: story & prose!!!! *Delia Owens* will soon be a household name to readers. What in the world will she write next? Kya Clark- aka- “The Marsh Girl’ has been abandoned, one by one, by every single person in her life. She lives by the seat of her pants, in a shack, eluding everyone, except a friend of her brother’s named, Tate. Where the Crawdads Sing by Delia Owens is a 2018 G.P. Putnam's Sons publication. Kya ran to the porch, watching her mother walking down the sandy lane in her fake alligator skin heels, her only going out pair, holding a blue train case. She never wore those heels and she never carried a case. That was the last time Kya saw her Ma. There has been fights before and Ma has left several times but she always came back. Over the next few weeks, Kya's oldest brother and two sisters left too. They were tired of Pa's red faced rages, which started out as shouts, then escalated into f Kya ran to the porch, watching her mother walking down the sandy lane in her fake alligator skin heels, her only going out pair, holding a blue train case. She never wore those heels and she never carried a case. That was the last time Kya saw her Ma. There has been fights before and Ma has left several times but she always came back. Over the next few weeks, Kya's oldest brother and two sisters left too. They were tired of Pa's red faced rages, which started out as shouts, then escalated into fist slugs or backhanded punches. Her Pa had fought Germany in the Second World War. His weekly disability checks were their only income. Her Pa eventually left her too at a very young age and Kya was all by herself. She lived in the marsh all by herself. She went to school once but she was teased and never went back. Steve and Benji saw a body laying in the mud. A man was laying flat on his back. Benji noticed it was Chase Andrews. They ride their bikes fast to the Sheriff's office. They let the sheriff know that they saw Chase Andrews flat out in the swamp under the fire tower. They let him know that he looked dead. The sheriff and the Dr. noticed that there wasn't any footprints near the body. None going toward the stairs or away from the stairs, none around the body and Chase Andrews footprints weren t there either. No footprints were found anywhere. This then turns into a murder mystery. I just loved the setting of this book, in the marsh. I loved the atmosphere and just felt that I was there. The descriptions of the environment, the scenery and nature was just beautiful. I am a bird watcher and loved her descriptions of the birds feathers. I also loved the mystery and suspense also. I really loved her writing style. Her writing was so beautuful. I just wanted to savor it. This was an easy five star rating for me. I loved the characters. I loved Kya the best. and felt so bad for her having to live the way that she did at a very young age. she was so intelligent. I loved Tate too, who taught Kya how to read and other subjects. I loved the poetry. I loved Jumpin and Mabel who were heroes. I could go on and on about this book but I could never give it the justice it deserves. One of my favorites for 2018? This was a Traveling Friends read and I thought it was a fantastic discussion. I loved reading this with them. Libby Wonderful review Mary Beth, one of my favorite books in 2018. I love bird watching too. So before I start off with my review there is something that I must confess to. While reading this novel there was always this niggling annoyance in the forefront of my mind telling me that I wasn’t connecting with the third person narrative here. I am not exactly sure what it was for me but that really bothered me that I wasn’t able to give this story my whole heart. Regardless of not connecting with the third person narrative I thought this story and the word Stunning, enchanting & emotive! I am super excited to share this review with you because the book is on my favorites list for this year. The writing is lovely, and the storytelling is brilliant. Barclay Cove is a quiet place along the North Carolina coast. I tried to imagine this setting and time period, as someone familiar with the area, and I could not quite fit where it was in reality; however, using the author’s extraordinary gift for description without being overly flowery, in my imagination, I can perfectly picture the mysterious marsh. The book begins with the story of Kya, a young girl whose mother walks out on the family, leaving the children to fend for themselves with an alcoholic father who is absent most of the time. Not to mention the fact that they live in the inhospitable marsh as squatters (there are, indeed, small settlements on the North Carolina coast today that were founded my “squatters”). Kya’s siblings are older, and they flee, leaving her alone with her father. She learns to care for herself at a young age because she has to. Kya is uneducated by choice and circumstance, though the town attempted to get her to attend at first. Even without schooling, she is sharp and caring, as she learns the ways of life through the marsh and all it has to teach her. For years, Kya lives this way and is known as the “Marsh Girl” by the townies. When a young man of the same age is found dead, everyone in town assumes it must have been Kya, and fingers are pointed. She has been involved with two young men who were entranced with her, but was Kya involved in the death of Chase Andrews? Where the Crawdads Sing is a glorious and equally somber coming of age story for Kya. Though she was called to a different life from the one she has always known, how much will her upbringing continue to control who she is? The writing is exquisite, the setting atmospheric on a grand scale, and Kya is a strong and unforgettable character I wanted to hug. Overall, I simply adored this book. I was immersed completely in Kya’s vibrant world, and my heart ached at every turn. The ending is memorable, and the messages are strong. Beautiful nature and a captivating story. Thank you to G.P. Putnam’s Sons for the ARC. All opinions are my own. Tom Lewis Awesome review Jennifer!! I loved this book! I can’t get over how perfect this book is. The writing grabbed me from literally the first page and kept me entranced. And the story! How can your heart not help but ache for Kya? First her mother leaves, then her siblings, even her ne’er do well father. Left to her own devices by the entire town, she survives without schooling or any aid. The preacher’s wife calls her white trash and hurries her child away from Kya convinced she carries disease. The marsh is a character in its own right. Owens does a magnificent job describing it so that we feel we are there, seeing every plant, bird and insect along with Kya. Owens paints the surroundings just like Kya paints, with a fine brush intent on getting every detail right. There are so many heartbreaking moments in this book. Kya just can’t understand why everyone leaves her. The murder mystery was very well done and I had no clue how it would play out. The suspense was killing me. So, this is my first five star book of 2019. It has everything - beautiful writing, great characters and suspense. Highly recommend it! Liz Rilet wrote: "Perfect is the perfect word to describe this book"
Glad to see you loved it, too. This is an incredibly beautiful novel from Delia Owens, totally immersive, an ode to the natural environment and the marshes in particular. Catherine Danielle Clark, aka Kya, is 6 years old when her mother leaves their shack in the remote wilderness of the North Carolina coastal marshes, next to the town of Barkley Cove. Her family is desperately poor, and before long her siblings follow suit, abandoning her to the care of her alcoholic, neglectful and abusive father, and at 14 years old, he too This is an incredibly beautiful novel from Delia Owens, totally immersive, an ode to the natural environment and the marshes in particular. Catherine Danielle Clark, aka Kya, is 6 years old when her mother leaves their shack in the remote wilderness of the North Carolina coastal marshes, next to the town of Barkley Cove. Her family is desperately poor, and before long her siblings follow suit, abandoning her to the care of her alcoholic, neglectful and abusive father, and at 14 years old, he too leaves her for good. Completely isolated, school proves to be a tortuous experience, she stays for only one day, avoiding all attempts by the truant officer and others to bring her back. Kya is the Wild Child, The Marsh Girl, Marsh Trash as far as the residents of Barkley Cove are concerned, directing hate, ridicule, contempt and hurtful prejudice at the bewildered Kya, as she becomes the target of harrassment and attacks, the community dehumanising and shunning her. No-one other than the black Jumpin and his wife, Mabel, offer help or advice to the lonely girl, and they face a barrage of racist attacks and humiliation themselves. Unable to read and write, longing for the return of her mother, Kya desperately desires company, and to belong. For a while, she receives some sustenance in the form of Tate, who looks out for her, teaches her to read and write, and shares Kya's joy in the marsh world with its insects, wildlife, birds, weather and her untethered hold it has on her, collecting ever rare feathers and shells. A close relationship develops between the two of them until he leaves to study marine biology at university. Tate leaving has the effect of chipping away at Kya's inner capacity to trust as she once again finds herself isolated, but her curiosity about the marshes, and her ability to paint all that resides within it, has her pursuing a deeper and more academic knowledge of it. However, she still wants to belong and her burgeoning sexuality and hopes for marriage and family are met with betrayal, treachery and worse. In a narrative that goes back and forth in time from the 1950s to the present of 1969 onwards, where the favoured son of Barkley Cove, the golden boy Chase Andrews is discovered dead by two boys, having fallen from a tower. There is no evidence of murder, but the Sheriff is uneasy, and Andrews’s mother and the town are bursting with rumours of murder so a trial ensues. Julier Just finished reading it. Beautiful review, Paromjit! You really captured the essence of the book. Paromjit Julier wrote: "Just finished reading it. Beautiful review, Paromjit! You really captured the essence of the book." Delighted you loved this too, Julier Julier wrote: "Just finished reading it. Beautiful review, Paromjit! You really captured the essence of the book." Thank you to Netgalley and G.P This is an amazing first novel by this author! 3.5 stars. Heartbreakingly unforgettable. Deeply symbolic. Hauntingly atmospheric. This is the story of Kya, a ‘marsh girl’ who grows up isolated from society. Abandoned by her mother at the tender age of six, Kya is left vulnerable and constantly awaiting her return. At the age of ten, Kya is deserted by the rest of her family, leaving her completely alone to fend for herself in the wild and unruly marsh. There are a few characters that enter Kya’s life, each having a direct impact on her devel 3.5 stars. Heartbreakingly unforgettable. Deeply symbolic. Hauntingly atmospheric. This is the story of Kya, a ‘marsh girl’ who grows up isolated from society. Abandoned by her mother at the tender age of six, Kya is left vulnerable and constantly awaiting her return. At the age of ten, Kya is deserted by the rest of her family, leaving her completely alone to fend for herself in the wild and unruly marsh. There are a few characters that enter Kya’s life, each having a direct impact on her development and views of the world. Each of the characters are memorable and very well developed. Kya’s story is one that will stick with you - it is emotional, disturbing, shocking and touching. While I enjoyed this story, I am the outlier in the sense that I did not love and adore this book as much as most others have. The biggest thing that didn’t quite work for me was the pace of the novel – it dragged throughout. The marsh descriptions, though vivid and atmospheric, felt too much at times and I was lost in these descriptions rather than the story itself. With that being said, I feel it was fully intentional to have such overpowering descriptions and that is what many readers truly loved and connected with – it simply didn’t work for me. Thank you to Edelweiss, G. P. Putnam’s Sons and Delia Owens for providing me with an ARC in exchange for an honest review! Where The Crawdads Sing is available now! Lovely poetic and still book. Full of atmosphere. Great story. Great writing. Beauty poems in the book illustrating the story, enchanting. Sort of surprise ending (or not....) 4 stars plus. Wow.... many recommended this book already and I would recommend it too. As night fell, Tate walked back toward the shack. But when he reached the lagoon, he stopped under the deep canopy and watched h Lovely poetic and still book. Full of atmosphere. Great story. Great writing. Beauty poems in the book illustrating the story, enchanting. Sort of surprise ending (or not....) 4 stars plus. It seemed like everyone had read this one already and couldn't stop raving about it. For some reason, despite all the hype, I just wasn't sure about this one—I thought it was going to be like the Jodie Foster movie Nell , about a feral girl alone in the woods who speaks her own language and somehow gets all tangled up in the real world. While there is a little bit of the girl-against-the-world thing, I needn't have worried. This book is heartfelt, warm, and endearing, and utterly deserving of t It seemed like everyone had read this one already and couldn't stop raving about it. For some reason, despite all the hype, I just wasn't sure about this one—I thought it was going to be like the Jodie Foster movie Nell , about a feral girl alone in the woods who speaks her own language and somehow gets all tangled up in the real world. While there is a little bit of the girl-against-the-world thing, I needn't have worried. This book is heartfelt, warm, and endearing, and utterly deserving of the praise and love being heaped on it. It is definitely a story that will live in my mind for a long time. In the 1950s, Kya is a young girl growing up in a ramshackle cottage in the marshes off the North Carolina coast. She is the youngest of five children, the daughter of a wounded WWII veteran prone to drinking and violence perpetrated on his wife and children. One day when Kya was six years old, her mother left, followed by each one of her siblings. Left to fend for herself, she learns early that she is the only one she can count on, and turns to the gulls and other marsh creatures for companionship, until she befriends a couple who runs the gas and tackle shop where she refuels her boat. "Her most poignant memories were unknown dates of family members disappearing down the lane. The last of a white scarf trailing through the leaves. A pile of socks left on a floor mattress." As Kya grows older, rumors swirl in town about the "Marsh Girl," and it becomes a show of bravery to run through the marsh, tag her house, and run freely home. But Kya is so much more than the little girl once ridiculed on her one day of school. She is sensitive, inquisitive, intelligent, and passionate about the marsh and the creatures that inhabit it. When she meets a young man willing to open more of that world up to her, she can't get enough, although it leads to the vulnerability of opening her heart as well. "'It ain't just that. I wadn't aware that words could hold so much. I didn't know a sentence could be so full." When Kya finds someone that she believes loves her for who she is, she is fearful about leaving the marsh but willing to do so for love. Yet once again, she learns she is the only one she can truly depend on. And in 1969, when Chase Andrews, once the town's football hero and the son of a prominent business owner, is found dead, the townspeople suspect Kya, as they have never believed her more than "marsh trash" even though she has proven herself capable of so much more. "For years I longed to be with people. I really believed that someone would stay with me, that I would actually have friends and a family. Be part of a group. But no one stayed. Not you or one member of my family. Now I've finally learned how to deal with that and how to protect myself." 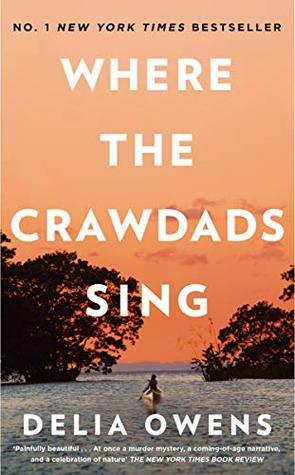 Where the Crawdads Sing is a love letter to nature, but it is also a beautiful story about what you can accomplish when people believe in you and instill you with that confidence. At the same time, it's a story which causes us to examine our prejudices against those who are different from us, how readily we want to believe the worst about people we don't even know. It's also a story about the beauty of human relationships, and how much they give us, even through the simplest of interactions. Delia Owens has created an amazing, thought-provoking book. Her use of imagery is so lyrical, almost poetic, that you can see the marsh, the gulls, the feathers, in your mind's eye. As great as that is, her characters are incredibly special. Even the characters who seem the least complex have surprising moments, but characters like Tate, Jumpin', Jodie, and of course, Kya, are simply amazing. There is a simple beauty to this book and so much heart. Read this and you, too, will be thinking about these characters for a long time afterward. Kya was only six years old on the day that she heard the screen door slap shut while she was scrubbing the grits out of the pot, and wondered who was leaving their shack. It couldn’t be her mother, her mother would have quietly closed the door, not let it slam shut on its own. She runs to the porch and sees her Ma in her long skirt and fake alligator high heels walking down the lane, carrying her train case. When she got to the end of the lane, she didn’t even turn to wave. Kya was the youngest, with Jodie being the closest in age to her, and three older siblings, Murph, Missy and Mandy. And Pa. But it isn’t long before the three oldest disappeared, almost old enough to make their own way in the world, and tired of Pa’s rages, the marks left on their bodies and their hearts. And then Jodie tells Kya that he has to leave, that he can’t live there, can’t take one more day of it. And Kya is left alone, more or less, with her Pa. A man who wanders off, not beholden to anyone to let them know when or if he will return, and when he does return he is almost always drunk. Barkley Cove, the town they live closest to eventually becomes determined that Kya should attend school, and so she is made to go, is escorted to the school, where the other children taunt her, tease her, and she never returns. Kya is branded, they called her the Marsh Girl, a label meant to mark her an outcast, but Kya is happier without them. She finds her family and friends in the gulls, and the shells she collects. She is sensitive to the lessons she learns from the waters and the land, the birds that come morning and night to be fed, trusting that she will always be there to feed them. Where this book excels is in the descriptions of her surroundings, there are so many moments in this story where the picture she paints is so beautifully true to this part of North Carolina’s coast, and most likely even more true in the 1950s. For me, the story felt as if it became a little bit bogged down in the last half of the book, where a mystery is being solved / resolved. A lovely reflection of the beauty that surrounds us in nature, in the still natural places in this world that man has not conquered or spoiled, and the nature within a young girl, a lyrical coming of age tale that feels as wild and promising as Kya’s world. This had me singing just like the crawdads do. A compelling coming of age story of a 7 year old girl, Kya, who grows up in a marsh in North Carolina. Abandoned and alone, as one by one, her mama, siblings and finally her dead beat dad, leave. Yet somehow, she survives and lives symbiotically with nature. And while she is anything but wild, taught by a fish catching boy how to read and write, the towns folk believe she is a marsh girl; pretty much a simpleton raised in the wild, not realizing she is a more intelligent being than the folks who put her down. When a death of a townsman takes place in the marsh, all eyes turn to her as being the prime suspect. Vivid characters and an abundance of wild life. What a delight in learning about what one man deems as swampy and unworthy; another one gleams at the joy of the intricate Ecosystem that is brimming and humming with life. Sort of reminds of the Great Alone. 5⭐️ for it had a surprising ending and damn it if I didn’t want it to end! I wadn't aware that words could hold so much. I didn't know a sentence could hold so much. Yes, I'm aware that I'm sharing the very same quote that my bestie used for this book. But if a quote ever applied to a book...it's that one for this book. The story follows the "Swamp girl" or Kya throughout her life. And her life is not a pretty one. She was a very young girl when her abused mother had all she could stand one day and walked down the lane from their shack that last time. Left with her abusi I wadn't aware that words could hold so much. I didn't know a sentence could hold so much. The story follows the "Swamp girl" or Kya throughout her life. And her life is not a pretty one. She was a very young girl when her abused mother had all she could stand one day and walked down the lane from their shack that last time. Left with her abusive father and brother Kya realizes that people don't stick when her brother also leaves. 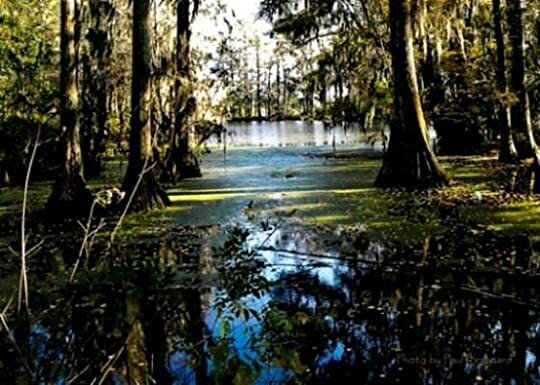 Left with her father Kya is forced to fend for herself in the North Carolina swamp. Her father soons disappears from Kya's life also. Then she is befriended by a 'town boy' and he teaches Kya how to read. Kya has learned to only rely on herself so trusting someone is completely new to her. It takes you to the lonely place of Kya's existance and makes you part of the swamp that she loves. It handles so many things much better than many other books have...prejudice and abuse..just to name a couple. Female fireflies draw in strange males with dishonest signals and eat them; mantis females devour their own mates. Female insects, Kya thought, know how to deal with their lovers. Booksource: Thanks to my hateful little book fairy. A swamp and a marsh are very different environments. A marsh is a thriving and nurturing place, and it's there, along the North Carolina coast, that Kya lived and survived after being abandoned by her family as a young girl. Kya spent her days alone, observing the surrounding natural world, and it served her well. Though she loved her marsh dearly, sometimes the loneliness was too much, especially as she gr Here we have it, my favorite book of 2018! I think this one will be hard to top. Amazing!! I don't want to ramble on too much about the plot. This stirring, character-driven novel is part coming of age story, part mystery, and part love story — between Kya and two young men who she allows in her hidden world, but most of all, between Kya and her treasured marsh. I finally got around to reading this uber popular book from last year. I really wasn't sure if this would be for me, but I ended up loving it, regardless of a few things that distracted me and parts I thought were highly improbable. Although there is a LOT going on in this one, I found it easy to follow. I was very emotionally invested in Kya's story and had a few theories about what would become of her ~ All were wrong! Loved the blend of mystery, murder, wilderness, nature, and the last twist- Never saw it coming! Holly B JanB wrote: "I was the outlier on this one but I am glad you enjoyed it despite misgivings 😊"
I've been the outlier too Jan on some hyped books! Which JanB wrote: "I was the outlier on this one but I am glad you enjoyed it despite misgivings 😊"
Holly B Suzie wrote: "Going to have to read this one so many good reviews!" I waited a while myself Suzie, but once you get into it, its a great story! A Haunting Tale of Resilience, Strength and Survival. The soul aches with the hardship and loneliness that permeates throughout much of “Where the Crawdads Sing.” If you’ve ever known what it feels like to be truly alone, this is a novel that will tear at you. Kya Clark is 7 years old when she is abandoned by every single member of her family, including her mother, thus becoming known as “The Marsh Girl.” Living in Barkley Cove, North Carolina, she learns to fend for herself in the wilde 4 Stars. Kya Clark is 7 years old when she is abandoned by every single member of her family, including her mother, thus becoming known as “The Marsh Girl.” Living in Barkley Cove, North Carolina, she learns to fend for herself in the wilderness, motoring her Pa’s boat, catching fish, bartering for gas and money for food. Before she knows it, she’s 18 years old. For a while, she dates Tate, who teaches her to read and who makes her feel whole, but then he leaves her too, just like everyone else. Thereafter, Kya dates Chase. It’s a whirlwind romance, though he never takes her out in public but makes promises of marriage and a home, all of which she believes, until she sees engagement photos of him and another girl in the local paper. How silly she has been to trust him. Years goes by, with Kya on her own, making a living by writing about her knowledge of the swamp, when a tragedy strikes and Kya is blamed. Kya, of course, has no idea how she will get through this as the Marsh is the only place that she has ever felt safe and now, even that has been taken away. Though “Where the Crawdads Sing” has an underlying message of hope, for me, Kya’s sadness is burned into my soul. Every moment she feels alone and/or she turns away from those who try to help her, I too, felt it and it brought me to tears. I remember that feeling and reading Delia Owen’s words made my heart break in two. No one should ever feel that way and the author captured Kya’s feelings perfectly. Though sad, the writing here is exquisite and perfectly lyrical that it will haunt me for a long time to come. That being said, I did find certain elements of this story to be implausible, specifically, Kya’s ability to take care of herself at such a young age, to recall what her family did to survive and know how to do it all herself at the tender age of 7. I don’t know of any other 7 year olds who could have the wherewithal to take care of themselves anywhere (indoors), let alone out in the wild. Implausibility aside, this is a moving novel that tugs at heartstrings, makes you want to wrap your arms around this girl and tell her that she is not alone. Delia Owens words are gorgeous and this story captured my heart like no other. Thank you to Emily Fortner and Mimi Chan at Goodreads, Penguin Publishing Group G.P. Putnam's Sons for an complimentary copy of this novel to read and review. Published on Goodreads, Amazon and Twitter on 1.23.19. Thank you to Penguin Publishing Group who provided an advance reader copy via Edelweiss. This is a very special book about a girl named Catherine Danielle Clark (known as Kya) who lived in a shack in the Marsh lands of North Carolina. The story begins in 1952 when at the tender age of six, Kya's mom walked out of her life, never turning her head back to wave goodbye. As the days passed, her older siblings gradually left as well, leaving Kya alone to deal with her volatile father. Pa would leave t Thank you to Penguin Publishing Group who provided an advance reader copy via Edelweiss. This is a very special book about a girl named Catherine Danielle Clark (known as Kya) who lived in a shack in the Marsh lands of North Carolina. The story begins in 1952 when at the tender age of six, Kya's mom walked out of her life, never turning her head back to wave goodbye. As the days passed, her older siblings gradually left as well, leaving Kya alone to deal with her volatile father. Pa would leave the shack for days on end, then suddenly reappear without warning. Eventually, even he left for good. This left fourteen year old Kya to fend for herself. However, this very clever and resourceful girl drew upon memories of watching Mom cook and clean, and navigating the motor boat with her Dad. When Kya's Dad was still at home and she could spend a little money, a barefoot Kya roamed the aisles of the local Piggly Wiggly market to buy grits. However, once Dad abandoned her, Kya's survival instincts kicked in. Remembering a skill Mom taught her, Kya collected mussels when the tide was low. Filling two large bags, she boated to Jumpin's Gas and Bait to barter her first deal of mussels in exchange for money and gas (for the motor boat). Compassionate to the little girl's plight, Jumpin' and his wife Mabel donated care packages of clothing and other necessities as needed. Besides these friendships, Kya's only other friends were the treasured birds and animals of the Marsh. That is, until she met Tate. Tate was out boating at the same time as Kya when she lost direction. Tate kindly directed Kya home, and this was the first dawning of their relationship. Over time, they shared their love of nature (such as collecting various bird feathers) and he even taught Kya to read. Kya was known as "The Marsh Girl", a mysterious and undesirable being to be avoided. She only spent one day in school after being treated as an outcast. Used to being abandoned and now comfortable in her self-imposed isolation, Kya set about painting in watercolors marsh lifeforms, such as mushrooms, seabirds and grasses. Now that she could read, she could both document and illustrate her love of nature. This story also revolves around a possible murder, that of Chase Andrews. His body was discovered by two boys in 1969, and the mystery of his death and his involvement with Kya is a slowly unfolding drama in the book. Through alternating time periods, Kya's life and the truth of Chase Andrews' death weave an atmospheric, poignant and totally engaging story. Delia Owens is the co-author of three internationally bestselling nonfiction books about her life as a wildlife scientist in Africa—Cry of the Kalahari, The Eye of the Elephant, and Secrets of the Savanna. She has won the John Burroughs Award for Nature Writing and has been published in Nature, The African Journal of Ecology, and International Wildlife, among many others. She currently lives in Id Delia Owens is the co-author of three internationally bestselling nonfiction books about her life as a wildlife scientist in Africa—Cry of the Kalahari, The Eye of the Elephant, and Secrets of the Savanna. She has won the John Burroughs Award for Nature Writing and has been published in Nature, The African Journal of Ecology, and International Wildlife, among many others. She currently lives in Idaho, where she continues her support for the people and wildlife of Zambia. Where the Crawdads Sing is her first novel.